Peter turned around and saw behind them the disciple Jesus loved — the one who had leaned over to Jesus during supper and asked, "Lord, who will betray you?" Peter asked Jesus, "What about him, Lord?" 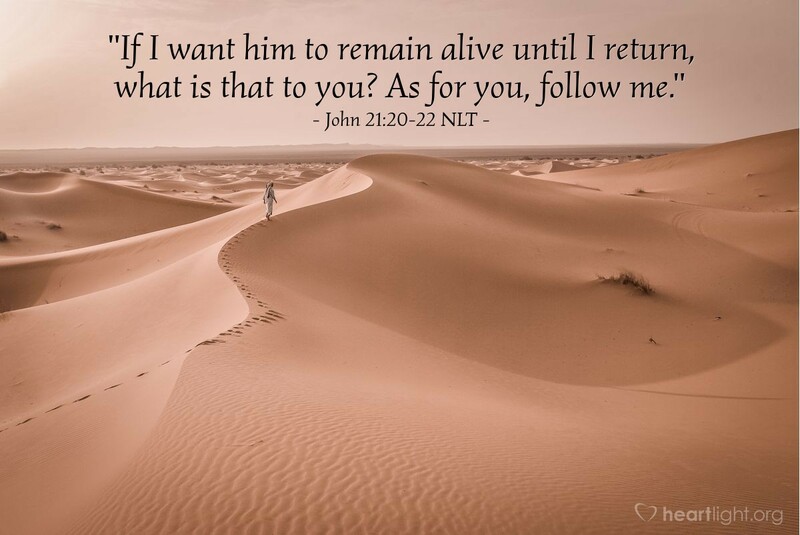 Jesus replied, "If I want him to remain alive until I return, what is that to you? As for you, follow me." It's so hard for us not to compare! We want to compare our lot with others. We want to compare our future, our faith, our church, our efforts, our ... with others. Our discipleship shouldn't be about comparing ourselves to others (2 Corinthians 10:12). God doesn't grade on the curve. He calls us to follow Jesus wholeheartedly. He calls us to uniquely important and distinctive lives of influence and grace. Comparing ourselves to others can be the cause of envy, jealousy, strife, covetousness, resentment, and a host of other sins. Of course, we can look at mature disciples for our examples. We certainly must look to Jesus as our goal, pioneer, and hero. And we must serve, help, and encourage others to pursue Jesus! O God, the Almighty and gracious Father, thank you for judging me with grace, empowering me with your Spirit, and calling me to a wonderfully unique life in your service. Forgive me for the times I've been envious of other believers. Forgive me for comparing my faith with others, whose hearts I could not know. Focus me on your will and lead me to you so that the glory that others see in me is attributed to your grace and presence in my life. In Jesus' name, I pray. Amen.